There are lots of different types of fasting one can do for various spiritual and health reasons. A Daniel fast early in the spring season can bring a time of re-set and re-focus on both counts. Below, you’ll find a Daniel Fast meal plan to help you along. What is the 21 day Daniel fast? While I believe strongly that a well-rounded diet with nourishing animal foods is best long-term, a temporary diet like the Daniel Fast can provide detoxifying and healing benefits. So what foods does a 21 day Daniel Fast actually include? What food can you eat on the Daniel Fast? 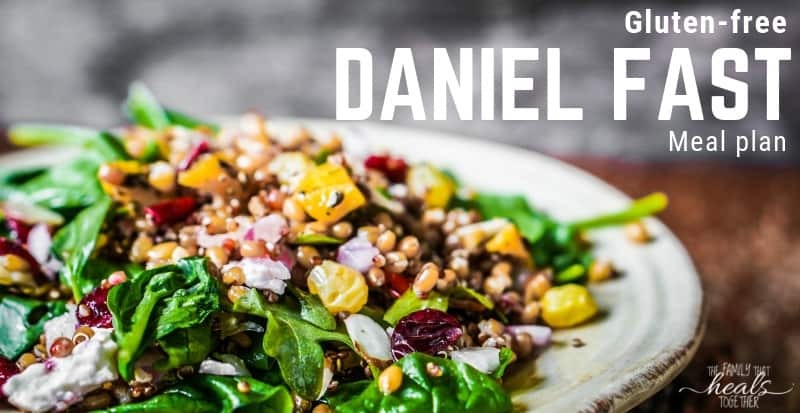 There are varying versions of the Daniel Fast, as well as something totally different called The Daniel Plan (which may be a good place to start on a healthier living journey, but is not what we’re talking about here). Daniel Fast oils can include those that are plant-based. Some sites say to avoid any solid fats, but I’m ok with using coconut and palm oils, as well as any good plant-based fat, such as olive and avocado oils. One should not use too many seed- or nut-based oils due to their high omega 6 content, which can be inflammatory. Think of the Daniel Fast as kind of a vegan Whole30. Like the Whole30, on the Daniel Fast, you will avoid dairy, meat, eggs, and sweeteners. However, you may include whole grains. 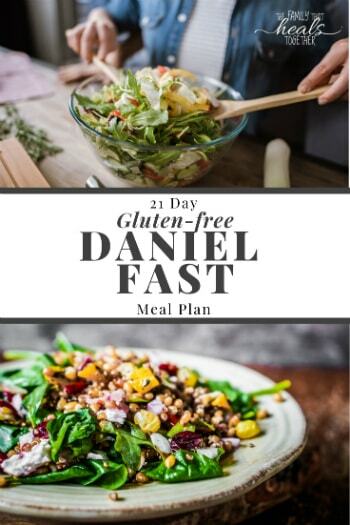 The Daniel Fast meal plan below will include some gluten-free grains and some recipes include dates or date paste. What can I eat for breakfast on the Daniel Fast? Lots of things! 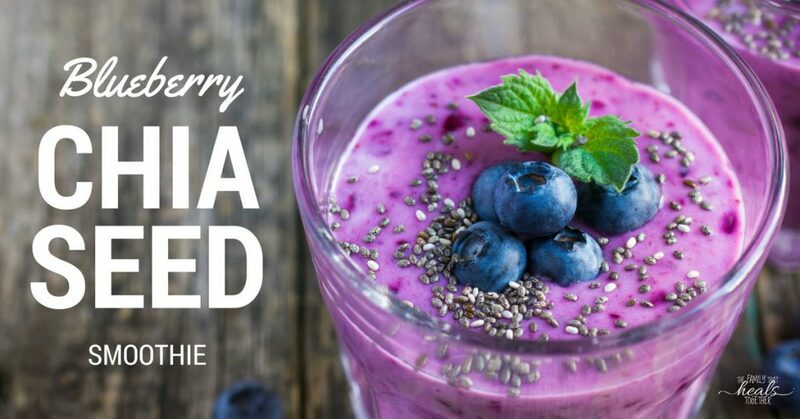 Fruit, dairy-free yogurt, oatmeal, smoothies, chia seed pudding, and paleo granola… the list goes on and on. See the breakfast suggestions in the Daniel Fast meal plan below. Is coffee allowed on Daniel Fast? No. On the Daniel Fast, you can drink only water and natural juices (fresh-pressed vegetable juices are a good option!). No caffeine is allowed. Can you eat eggs on the Daniel Fast? No. The Daniel Fast does not allow any animal products. Can you eat oatmeal on the Daniel Fast? Yes. If you tolerate oatmeal, it makes a good breakfast option on the Daniel Fast. Look for oats labeled organc and gluten-free in order to avoid toxic pesticides and gluten. Can I eat popcorn while on the Daniel Fast? Yes you can. You may use natural salt and herbs or spices, but no butter, and should make fresh stovetop popcorn from the bulk kernels, not bagged microwave popcorn. Did you know that if you don’t tolerate corn, you can make popped sorghum? Find the instructions here. Can you eat pasta on the Daniel Fast? Yep. To avoid gluten, look for lentil/bean-based pastas like this or rice pasta like this. Can you eat fish while on the Daniel Fast? Nope. No animals. Not chicken or fish even. Can you eat tortilla chips on the Daniel Fast? You could, if they’re baked and you tolerate corn. If you choose to eat chips of any kind, stay away from those that are fried and use discernment with ingredients. Look for ones with only quality oils and salt. So what are you going to eat for the next 21 days? Below you’ll find a complete meal plan to get you through 21 days on the Daniel Fast. Base your shopping list on the meal plan below, and break it up into buying a week’s worth at a time to minimize trips to the store. Prepping some foods ahead of time will help to ensure success. Make big batches of homemade crackers, hummus, and vegetable broth. Make a batch of Caulifredo Sauce, subbing vegetable broth for the chicken broth, and keep it on hand to serve over pasta for a quick meal. Chop your fruits and veggies ahead of time, at the beginning of the week. If you work outside of the home, consider prepping the lunches and snacks you will pack at the beginning of the week as well. Buy or make additive-free nut butters, which will be helpful to have for quick snacks and to add to smoothies and breakfast bowls. You can also make these tortillas ahead of time to have for wraps for breakfast, lunch, or dinner! I tried to look closely at recipes and make notes about substitutions, however, please pay attention as you’re making your shopping list and following recipes in order to avoid off-plan oils and sweeteners. Keep plenty of greens and fresh fruits and veggies on hand to supplement meals and have snacks when needed. Ideally, you would eat more vegetable is you’re still hungry after a meal, but you can also add a side of rice, quinoa, or beans to bulk meals up if you’re finding the below suggestions are not enough to keep you satisfied. The air is warming up, which means I’m craving all the fresh things like salad. 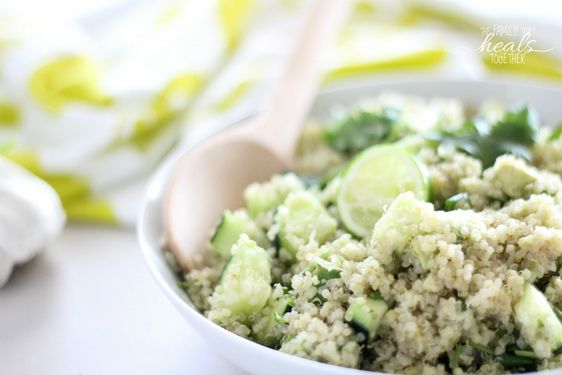 This easy quinoa salad is quick, nutritious, and gluten-free & vegan to boot. Early in my healthy eating days, I was introduced to a small, seed-like psuedo-grain. Quinoa (I mistakenly pronounced it ken-oh-uh, if you’re wondering) boasted a high-protein content (a plus for my vegan days), and was easy on my digestion, needing little to no soaking. Since switching over to a primarily paleo-style diet, quinoa stopped getting much play in my kitchen, which is a shame because it’s so versatile. Cue the Bubba voice, “Quinoa breakfast porridge, quinoa stir-fry, quinoa salad…” You see where I’m going with this; quinoa can flex some muscle when needed. Best quinoa salad? I think so. Since doing some gut healing and experimenting with different foods, I’ve found that quinoa seems to be a safe starch for me. If it doesn’t work for you, that’s ok, there are tons of grain-free recipes here, including my favorite chopped salad. If you CAN eat quinoa, congrats! 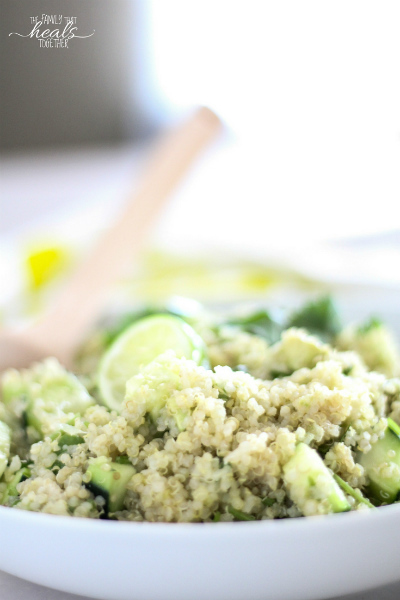 this easy quinoa salad is for you- and pssst… it’s the best quinoa salad ever! 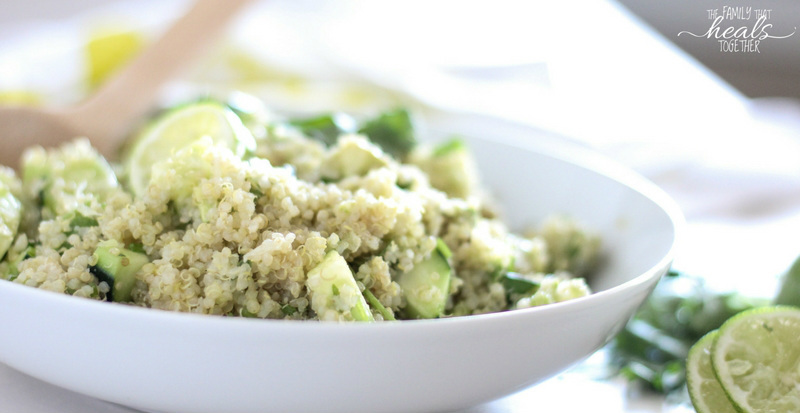 Not only is this salad super fresh and yummy, it has some distinct health benefits, which is why I’ve dubbed it a Quinoa Detox Salad. Let’s look at the ingredients to see just how hard they’ll work for you and your lovely bod. is a complete protein, which is rare for plant-based foods. This means it has the complete profile of all 20 amino acids, including the 10 essential acids our body doesn’t produce on its own. is actually more of a seed than a grain, based on its botanical makeup, which means it may actually be a suitable source of good carbs for those who stick with a mostly grain-free diet. is a good source of minerals like manganese, magnesium, and phosphorus. In addition, this easy quinoa salad is chock full of veggies and greens, some of which are detox powerhouses. Cilantro- known to help chelate heavy metals, cilantro should grace our tables daily! I like to add it to fresh-pressed juice, salads, guacamole, and anything else I can match the flavor profile to (I’m not one of those poor people who think it tastes like soap, thankfully!). Lime juice- lime juice is a diuretic that helps to flush toxins from the body. It’s also rich in vitamin C and antioxidants, which help rid the body of free-radicals. Garlic- a powerful antimicrobial, antiviral and antifungal, garlic can help with everything from the common cold to parasites. It contains a special compound called allicin which can also help relieve symptoms of allergies. Avocado- I don’t have to tell you how nourishing this good-for-you fatty fruit is. Avocados are also loaded with fiber and more potassium than bananas. Olive oil- rich in monounsaturated fatty acids, olive oil is best used cold. Look for high-quality, organic, extra virgin olive oil bottled in dark glass. Cucumber- a good source of b vitamins and fiber, cucumbers are also hydrating because they have a high water content. This salad is well-balanced enough to be a full meal of its own, or works great as a side dish next to a steak. To speed things along and take the guesswork out of perfectly cooked quinoa, I cook it on the rice setting in my Instant Pot. Let’s get on to the recipe for my favorite, super easy quinoa salad, since I clearly don’t need to convince you any more to try it! Cook the quinoa according to package instructions (note: I prefer to use the rice setting on my Instant Pot for perfect, easy quinoa every time. Use 1 cup water for 1/2 cup quinoa. ), then move to refrigerator for 30 min- hour to cool. In a pinch, you can pop it in the freezer for a shorter period of time to cool more quickly, or make ahead and store in refrigerator to keep at the ready. Meanwhile, peel and chop the avocado and cucumber into 1/2" cubes and set aside. Combine fresh lime juice, olive oil, salt, and pressed garlic in a small bowl and stir well. Add veggies, cilantro, and oil mixture to the quinoa and stir carefully to combine well. Serve cold and fresh. Keeps covered in fridge for a day or two, but the avocados will brown. *some believe that eating grains, nuts, and seeds that have been "activated" through soaking or sprouting makes them more digestible and their nutrients more bioavailable. This is the idea behind sourdough bread. You can soak your quinoa with about a cup of water and a tsp of salt or apple cider vinegar for 2-4 hours before rinsing and cooking, or just purchase pre-sprouted quinoa for better digestibility. I personally like this sprouted quinoa best. While I’m not afraid of some well-sourced cheese or raw milk (and have plenty of dairy-containing recipes on this site! 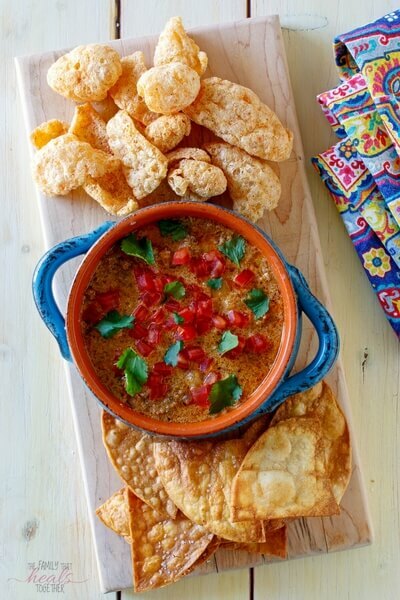 ), our family recently cut dairy products and this dairy free queso dip recipe is the result. We love it and think you will too! We’re finally settled back in west Texas, and though south Texas has its own sense of flare, I couldn’t be happier to be back in the queso capital of the world (ok, I just made that up). The problematic thing is, I’ve recently been avoiding cheese. Ho hum, I know. Without cheese, what is life? I promise going dairy free is not equal to death. 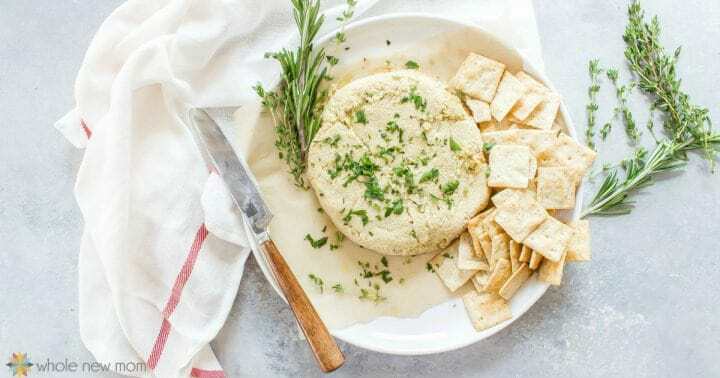 Thankfully, dairy free cheese choices abound and I’ve had lots of fun experimenting (like with this dairy free queso dip recipe, but we’ll get to that soon). It turns out you can find all kinds of dairy-free lovelies at most health food stores these days: (imagine my best Bubba voice) dairy free cream cheese spread, dairy free yogurt, dairy free milks… you can make just about anything dairy free. It’s true! Unfortunately, many store-bought options aren’t paleo-friendly, or even very healthy because they contain things like maltodextrin (a corn-based additive our family doesn’t tolerate well), soy, and other junk. I was even shocked to find an almond-based shredded cheese pack that contained… wait for it… casein! What?! If you’ve been following along, you know that casein is the protein found in milk. And while our family has done ok on high-quality milk and other dairy products for years, we recently decided to take a break (ok, I recently decided the fam was going to take a break) for a number of reasons. While I plan for the dairy hiatus to be temporary, there are a few reasons to avoid dairy if you’re dealing with chronic health issues. have asthma, again, because dairy can cause buildup of mucus in the lungs and exacerbate breathing problems. suffer from sleep apnea, for the above reasons. battle chronic illness that has not eased with other diet changes. This is what led our family to trial removing dairy for a time, and it seems to be helping with chronic migraines. have a child with autism or related disorders. Read more below. Dairy can make you feel high. Particularly for children with autism this can be a problem, and I thought it worth mentioning before I get to the queso dip recipe. You see, many of us have trouble digesting dairy, rather casein, the protein in dairy. For those of us with impaired digestion, like many children with autism, those proteins go undigested into the bloodstream, and are then converted to casomorphins. These casomorphins attach to the same brain receptors that heroin and other narcotics attach to. Yup- the protein in dairy can essentially become morphine and go directly to the brain and effect mood, behavior, and emotions. It’s for this same reason that many children with autism demand cheese all day long- the cheese is turning into a drug and their bodies can’t get enough of it! If I’ve convinced you to take a walk on the dairy-free side, you’re going to appreciate this queso dip recipe! I’ve made it several times now and some of my family members don’t even know the difference. It definitely fills that melt-y, sauce-y, down south void when you’re wanting something warm, comforting, and worth sharing! And while I fear that a cheese-free cheese dip feels wrong here in Texas, the truth is, I don’t wanna be right. If the reaction I’ve gotten on Instagram is any indication, y’all feel the same! Case in point: while traveling, I stopped in to have lunch at my favorite restaurant in Austin, TX, where they serve up delicious paleo fare. Mr. Incredible and I were blown away by their cashew-based dairy free queso dip, and when I posted a pic, so many of you asked for the recipe! While I can’t share exactly how that fantastic dip is made (’cause I don’t know), I did determine to create one of my own. Find the recipe below, then be sure to come back and let me know what you think. it’s important to find a non-fortified nutritional yeast. Many manufacturers add folic acid, a fake b vitamin which many of us can’t process. I’ve linked up to a clean one in the recipe below. nutritional yeast is a good source of b vitamins even without fortification! That’s why it’s popular among vegans. nutritional yeast has a distinct smell that might catch you off guard if you haven’t yet used it. 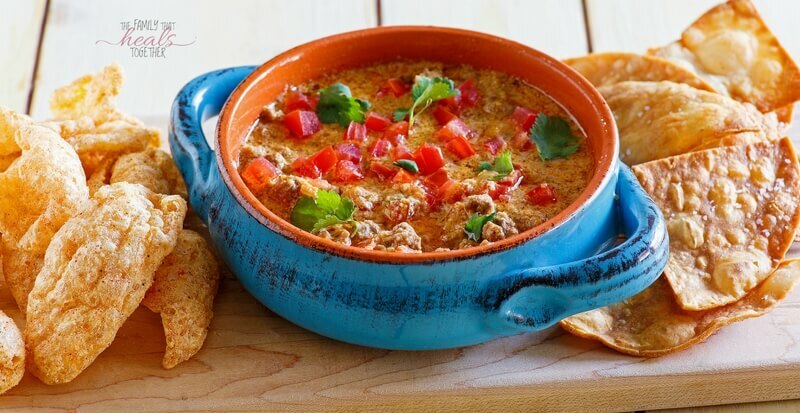 Don’t be turned off, as the taste is delicious in things like this dairy free queso dip recipe. Just be careful not to breathe in the powder as you open the bag and scoop the yeast out. Additionally, although dairy-free queso dip recipes are popular among vegans, clearly, with the added seasoned beef, this recipe is not vegan. However, this recipe could theoretically be made without the ground beef and still be delicious and also vegan. In a large skillet, sauté chopped onion in tallow over med low heat. Add ground beef and cook til browned, stirring and chopping meat as you go. Add tomato sauce, salt, chili powder, garlic powder and cumin and stir well, continuing to cook. Add green chilies or salsa verde and stir. In a high powered blender, combine water, cashew pieces, nutritional yeast, and 2 cloves garlic and blend until creamy and smooth. Add to ground beef mixture and stir well. Turn heat to low and simmer a few more minutes until desired thickness is reached. 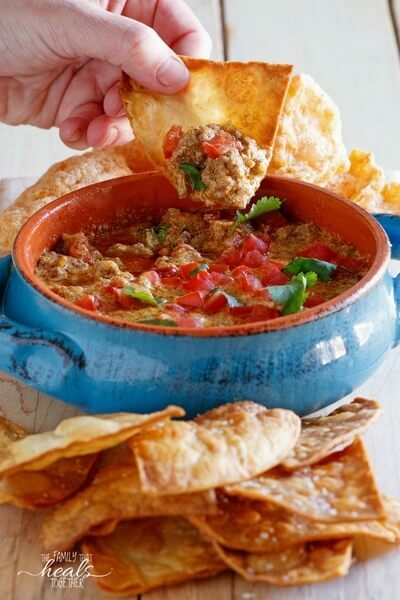 Move to a serving dish (or small crock pot set to low), top with chopped cilantro and tomato, and serve with grain-free chips and pork rinds. The ability to make paleo tortillas opens up a whole new world of fun recipe possibilities! Get the recipe below. Tortillas are one of those things that everybody loves… and once you go grain-free, you’re sure to miss them. We eat lettuce-wrapped “tacos,” but it’s really not the same. A lot of recipes for paleo tortillas taste too eggy or have other strong-tasting ingredients. I really wanted to make some legitimate tortillas, ones that taste good on their own and not just as a vehicle for their tastier contents. These paleo tortillas fit the bill. You can make several batches at once and freeze some for later, or eat them fresh out of the skillet in all the same ways you would a regular tortilla. A note on almond flour: you’ll notice I don’t usually include almond flour in my grain-free recipes. I used to have terrible reactions to almond flour, so I avoided it for a long time. I personally think it can be really inflammatory for a lot of people. There’s something like 70 almonds in one cup of almond flour! I don’t recommend eating it every day, but I think it’s fine on occasion if you tolerate it. The smooth texture and neutral flavor are perfect for so many recipes, including these paleo tortillas. It’s important to be sure you use a blanched (skins removed), finely ground almond flour. Many brands are too coarse and do not create pleasing results. I personally found this brand to be surprisingly good, and this brand comes highly recommended as well. 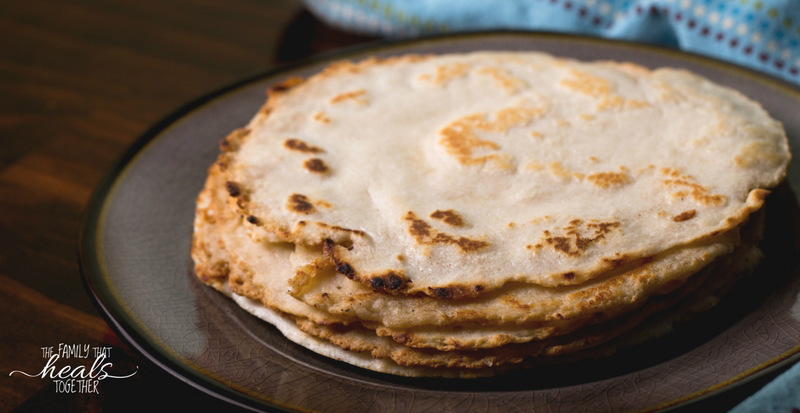 We love using these paleo tortillas for quesadillas (what kid doesn’t love quesadillas?! ), enchiladas, even peanut butter and banana roll ups! The possibilities are endless. The real test was whether the tortillas tasted good with butter and honey, one of my favorite snacks of all time. What’s that you say? That’s weird? Hm. You should try it, because they totally do taste just right slathered up with butter and honey. Blend all of the ingredients in a blender, making sure to scrape the sides if need be so that the batter is smooth and not clumpy. Heat skillet on med-low heat. Put a dollop of butter or palm shortening in the skillet to prevent sticking. This is important. Do this before cooking each tortilla. Scoop about 1/4 cup of the batter onto the skillet and smooth it out quickly with a rubber spatula. It will begin cooking and thickening right away, but the batter is pretty forgiving and will let you continue to smooth it out for a bit. Let the batter cook on the first side for 2-3 minutes before flipping, then cook on the second side for another 2-3 minutes. Repeat steps with remaining batter. Watch the video below to see how truly easy these tortillas are to make! Know someone who would love paleo tortillas? 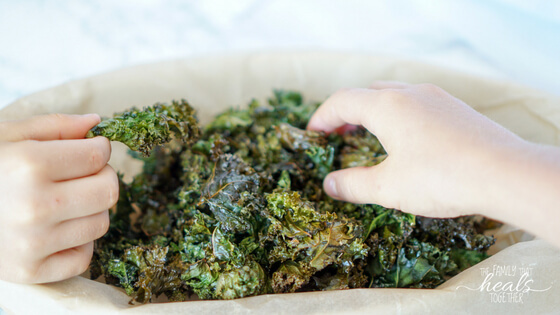 Give this recipe a share for your paleo pals! 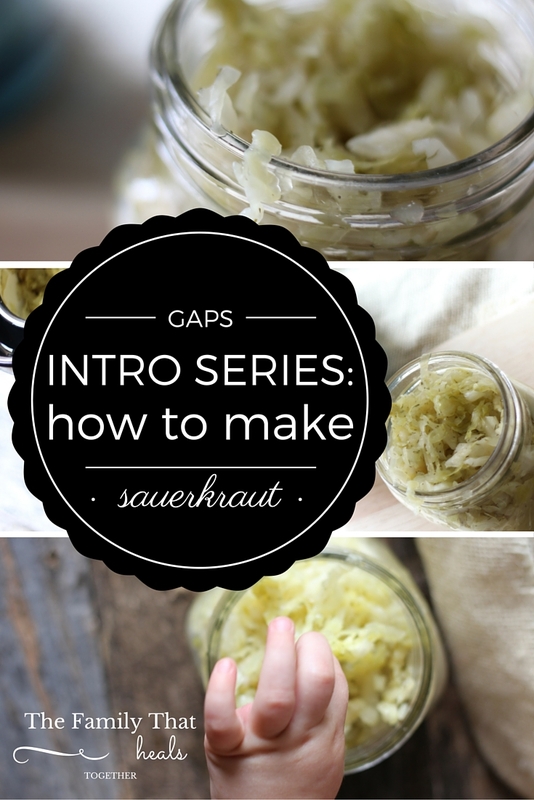 Sauerkraut is an integral part of the GAPS intro diet– there’s no way around it. From the early stages of drinking a small amount of sauerkraut juice with each meal, to later on in intro and beyond, when you can eat as much sauerkraut as you can tolerate, it is a staple food that one you should learn to like. 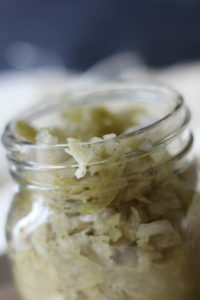 Homemade sauerkraut tastes so much better than store-bought, is healthier and fresher, and will save you lots of money! It is worth investing in some kitchen tools and learning to make this traditional food! Funny enough, ever since I started making this delicious traditional food, my boys will not touch store-bought sauerkraut. They taste weak, bland, or (some of them) even downright foul! But, my boys happily devour my homemade garlic dill sauerkraut straight outta the jar, spoonful by heaping spoonful! In fact, I can’t keep up with their consumption, so I did buy some high-quality, raw sauerkraut from the store. It was a no-go. Even I can barely stand the taste. It just goes to show that if you’ve tried sauerkraut and haven’t enjoyed it, try this recipe and it will change your mind! I have found unequivocally that I prefer to use a fermenting crock over any other method of fermenting vegetables. A crock allows air to escape as the fermentation process creates gases that need expelling, but does not allow air into the crock, which will cause spoilage of the vegetables. 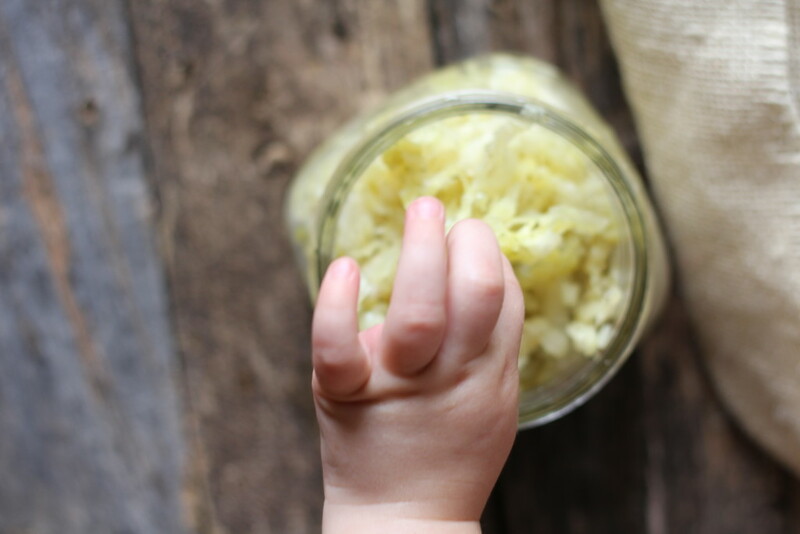 With a one-time investment in a beautiful crock, you will be able to make sauerkraut for years to come- and even pass on your crock to generations to come as a family heirloom. I love the idea of teaching my kids to make this super food and someday passing my crocks on to them! Look for a crock like this one. 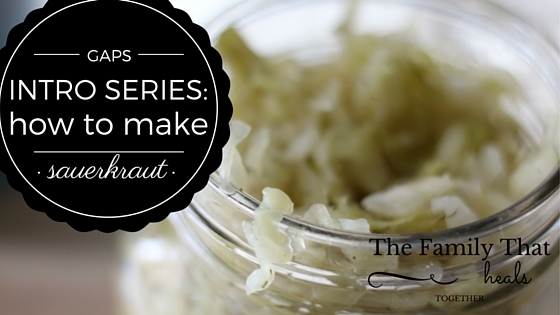 If you don’t have a crock, you can still make sauerkraut! While I’ve found that a crock is my favorite way to make it, you can start out with a basic canning jar. Make sure the lid is sealed tight and place in the refrigerator after about 3 days. Because a canning jar has no way of letting the gasses created by fermentation escape, you cannot let it ferment for very long or you will risk the jar exploding. Adjust your ingredient measurements to the size of jar/s you have available. You will know the kraut needs to go in the fridge when the lid begins bulging a bit- but do not let it go too long! Another option is to use a special lid created to be used on canning jars, which lets the air out without letting any air into the ferment. This is an example of what to look for. Bonus- this kraut is chalk full of garlic, which is a potent anti microbial, so it helps to kill off some of the nasties you’re already tackling by doing GAPS! 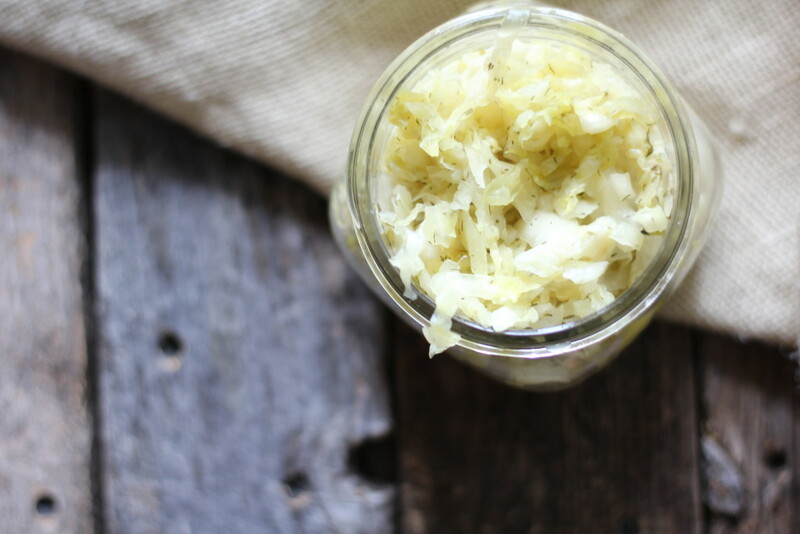 So much better than store-bought, this sauerkraut is tasty and super nourishing! Chop the cabbage into large pieces and remove the core. Using a very sharp knife, begin slicing the cabbage into the thinnest slices you can manage. After you have about 1/4 head of cabbage sliced, put it into the crock and top with a smashed/pressed clove of garlic and 1 tsp ea real salt and dill. Using a kraut pounder, a blender tamper tool, or your fist, smash the sliced cabbage in the crock until it's wilted and juicy. Repeat previous steps until all three heads of cabbage have been sliced and pounded and the crock is full, layering each batch of sliced cabbage, garlic and spices over the last. The cabbage should have produced enough juice to completely cover it. Place weights over the cabbage to submerge it completely under the juice. If crock has a water reservoir around the top, fill it with filtered water, then place the lid on it. Allow to sit out at room temperature for a minimum of 2 weeks.